We sell and we rent out the best wheelchairs in Singapore. within Singapore and/or out to Overseas. to recommend us to your friends! Deposit of additional S$200 applies*. *We will return the deposit when you return the wheelchair. *If you later decide to extend, we will deduct from the deposit. *If you later decide to return early, we will return the extra according to the rental rate. Delivery islandwide is available at $50/way or $100 for both delivery & collection. Very compact - Foldable top handle, fits all car and taxi boots/trunks. Can even fit Suzuki Swift. Weighs 20kg, accommodate up to 120kg. Deposit of additional S$500 applies*. Used motorised wheelchair available for sale. SMS 84483924. "Rent wheelchair (self-controlled OR attendant-controlled) from DD/MM to DD/MM. (NAME). <If delivery is needed, state preferred Address and Time>"
We will reply with the confirmation of fees/deposit and arrange for delivery time. 3. Visit our showroom at an agreed time. Opening hours: 9am-9pm (Mon-Sun). Carpark is Free. 4. Fill up the order form at the Contact Us page. *Collection point is at (Kensington Park Drive Condo). Click here for directions to rent wheelchair in Singapore. *Payment of Rental Fee, Delivery Fee(if any) and Deposit should be made upon collection or delivery. *$200 Deposit will be returned against the return of the wheelchair. Deposit may be used to cover damages to the wheelchair, (Although this seldom occurs as our wheelchairs are tough and stood for 3 years without repair). Directions to Luci Wheelchair Co.
From North or City, Exit Ang Mo Kio Ave 3 from CTE. Head towards East (Hougang). Enter into Serangoon North Ave 1. Turn right, left and right into Kensington Park Drive Condo. Condo is between an Indian Hindhu temple and Serangoon Garden Secondary School. Do not enter from Serangoon Garden. If you are driving, please park at the yellow stripped (unsheltered) parking sites for visitors. Parking is free. Sheltered parking sites are reserved and allocated for residents of condo. If you are with a metered taxi, or if it rains and it is urgent, please call us for a quick 3 min. pick up at the sheltered lobby. From Ang Mo Kio MRT, take bus 25,73,74, 76, 132, or 165 along Ang Mo Kio Ave 3. Head East direction. Alight 6 stops later or once you see a French School (modern architecture) on the opposite (right)side of the road. Cross over a pedestrian bridge. Walk due South. Location is between Serangoon Garden Secondary School and a Hindhu temple. From Serangoon MRT, take bus 315, a loop service. Stop at Serangoon North Ave 1 Blk 112 and head West through Blk 111. 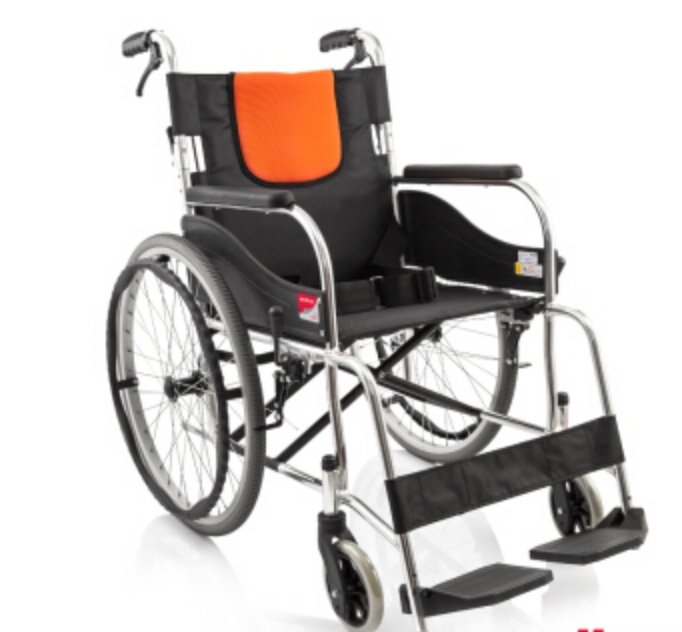 Lightweight wheelchairs for rent in Singapore from as low as $10/day! Our clients rent wheelchairs for a variety of reasons: temporary injuries, tourists with aged parents, short trips overseas etc. Whatever your needs are, we have a wheelchair for you to rent. 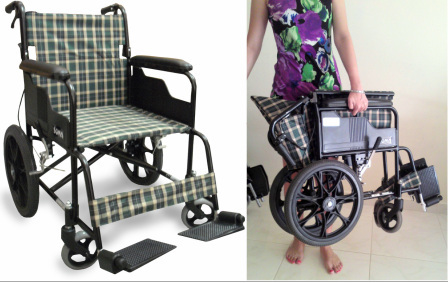 Rent great quality yet economic budget wheelchairs in Singapore. You can also first rent our wheelchair in Singapore and then bring it in your travels to other countries. We operate out of a home office, which means that we pass the savings to you! 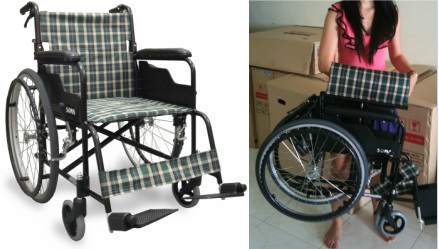 Order your rent wheelchair in Singapore now! All our wheelchairs for rent are almost new and in good condition. We clean and disinfect the wheelchairs before and after each rental to ensure hygiene. Unlike other wheelchair shops that sell many varieties, we select the best quality and value for money. Our wheelchairs are durable and has to be durable, since we rent them ourselves. We believe in helping our clients buy the most suitable and the most value for money wheelchairs. That's what drive us forward. As seen on gumtree.sg to rent wheelchair.